One of the most sought-after requirement when having a large number of products is updating the regular prices of the WooCommerce products. Although WooCommerce provides this feature in its bulk editing settings, it is incapable of filtering products based on your business requirement. Hence you need an advanced WooCommerce bulk editing solution like ELEX Bulk Edit Products, Prices & Attributes for WooCommerce to do this job. In this article, I’ll demonstrate how you can bulk edit WooCommerce Product Prices with ELEX Bulk Edit Products, Prices & Attributes for WooCommerce. Let us take a use-case where we want to update regular prices of ‘Clothing’ products that are priced more than or equal to $30, to $20 each. This type of customization is not available in WooCommerce inbuilt bulk edit settings, but it’s easily possible with our ELEX WooCommerce bulk edit plugin. 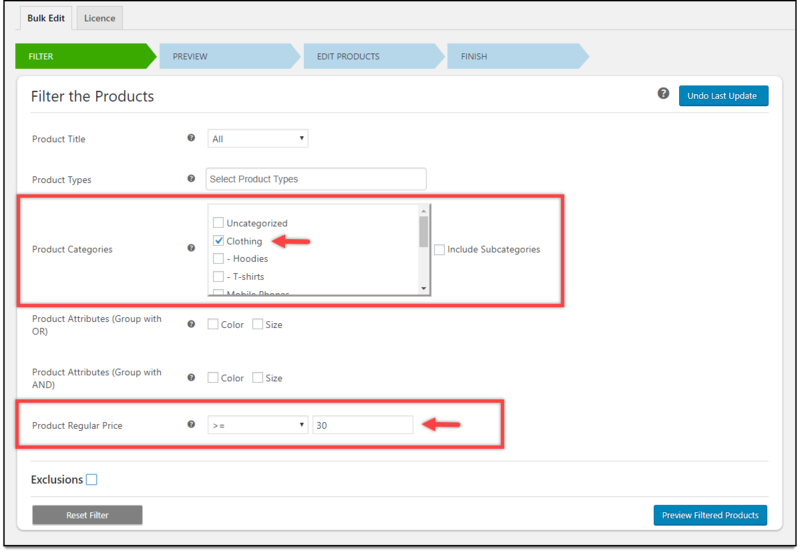 In the first step, you should filter your desired products using the filters provided by the plugin. For our demonstration, we should select the product category ‘Clothing’ from the Product Categories filter. Next, in the ‘Product Regular Price’ filter, select the condition as greater than or equal to (>=) and enter the value 30. The preview stage will show you the filtered products. Based on our demonstration, the plugin has filtered all Clothing products that are priced $30 or more. The plugin offers various product properties for bulk update. But for our demonstration, we need to scroll down to find the ‘Price’ section. 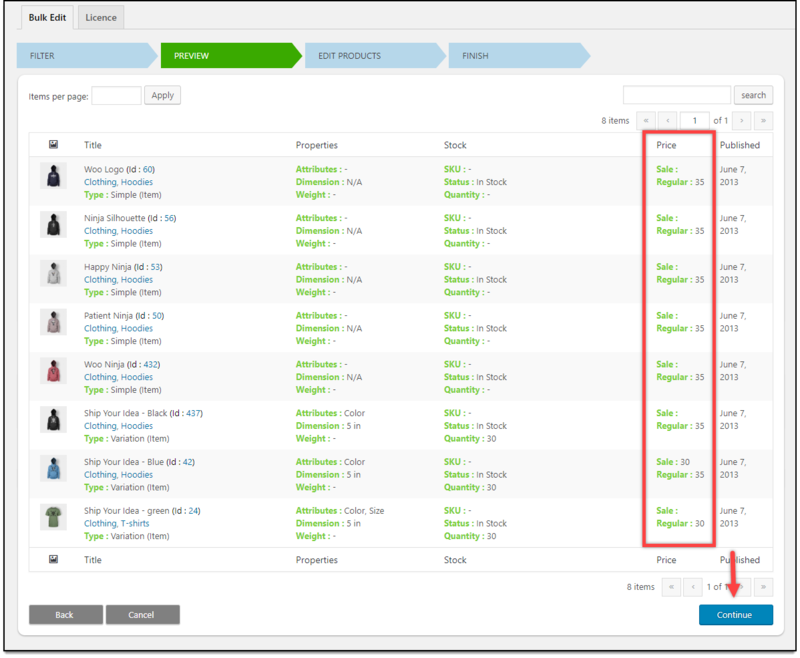 The plugin offers two Product prices properties to edit in bulk; Sale Price and Regular Price. Since we want to update regular prices, we should select the required condition from the drop-down list. With this plugin, you can increase or decrease regular prices in percentage value, increase or decrease regular price in amount value, In addition to this, the plugin allows you to set rounding values. Or set a Flat Price for all the filtered products. For our demonstration, we need to use the Flat Price for all option and set the value as $20. This means, the regular prices of the filtered products having prices $30 or more, will be configured to flat $20. 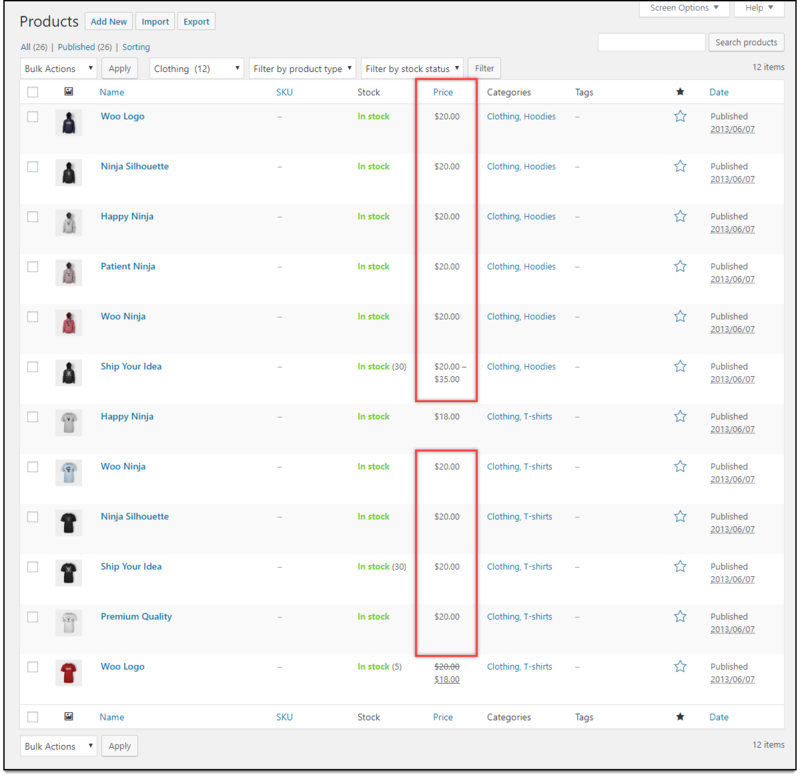 Open the WooCommerce Products page and filter the products based on ‘Clothing’ to see the updated changes. Or you could also check the Shop Page of your WooCommerce store to see the new price of the products. In this way, you can bulk edit WooCommerce product prices. If a product(s) has its Sale price greater than $20 (or the amount you have assigned), then the product will be skipped and you’ll see a warning message as shown in the screenshot below.